To go to Topas Eco Lodge, you go along connecting road from Sapa to Thanh Kim was still under construction along the mountain. Muong Hoa Valley is down under with endless terraced field dotted with grey roof tops of Lao Chai and Ta Van villages. 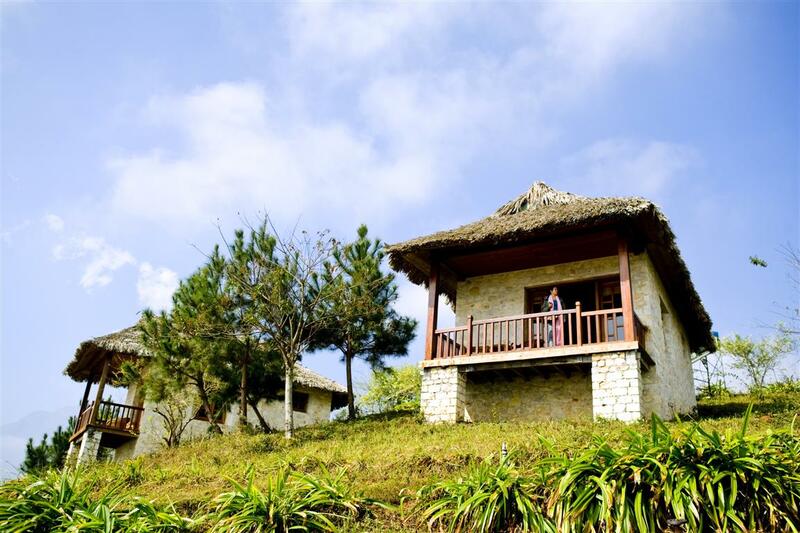 Topas Eco Lodge is about 18km from Sapa, and about one hour car driving. But it seems to be another world. It is different from the modern life. It was constructed since 2003 and opened since 2005. Two hard years with rainy and foggy days and weeks. All of 25 small houses are built with local white granite marble and palm tree covered bought from Van Ban. 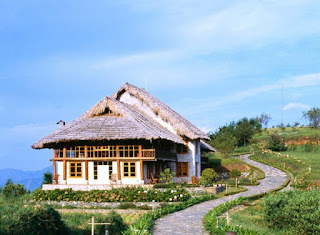 All the rooms are decorated simply with wood, bamboo to have a friendly feeling to nature. Especially, the restaurant and bar are built in a stilt house bought in Van Ban. It was unmatched and moved here along the Red River before transported to this place by buffalo cart. Designers of this ecological tourism area have put a special concern to the nature and lives of local people. All the houses use the energy from solar. In order to prevent the effect to the water resources, the water is taken from a private stream of 4km far from the place. The water is managed and treated by a special filter system. The waste water is also treated. You will have a chance to use a special kind of shampoo and bath gel to prevent environmental effect. Each of the house have direct view to the valley, where you can sit and read in the middle of the space of wind and mountain. Sky high and valley deep. Such a spectacular feeling. If the water allows, there are lots of interesting destinations around Eco Lodge. 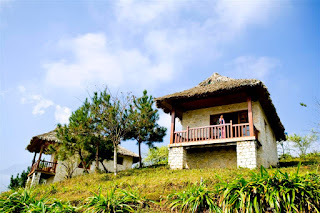 You can visit Ho Village, Thanh Phu, Thanh Kim villages by jeep car, by bike or on foot. The Ho Village is located right under the Lodge. There are about 100 houses along a stream. The area will be covered by a thin fog in the afternoon. 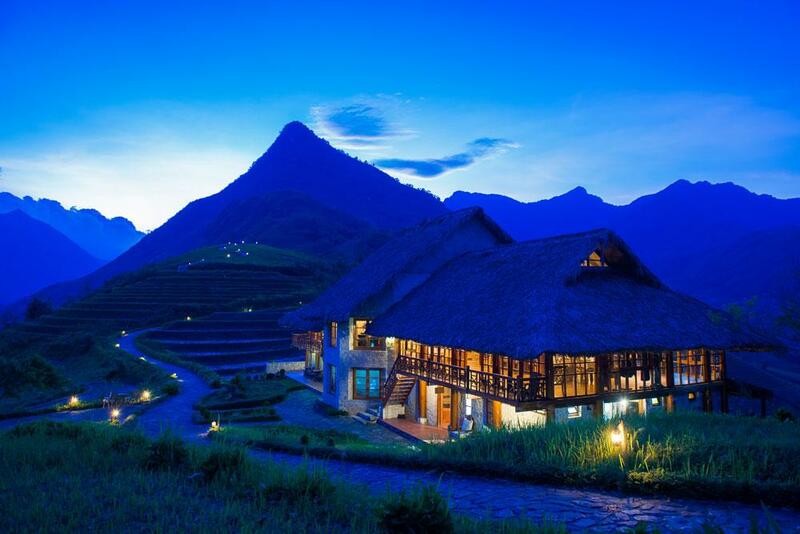 The Eco Lodge night is miracle beautiful. The wind blows, the roof rustles. We can hear the stream and forest sounds while sitting in the lobby, not to mention the sky of star. Until you feel cold by the fog, you can come inside to have peaceful sleep. In this peaceful area, people can lose track of time. There is no date, just morning with sun rise, noon with wind and afternoon. If you wake up early in this beautiful day, you can witness the sun rises around 6 a.m. The wind starts to blow near the noon. And if you stay in the room, you can feel the wind until afternoon.